There are many healthy and unhealthy food choices on the market today. Many of the unhealthy varieties have become commonplace as a matter of convenience. However, there is a large selection of foods that are particularly bad for older adults. Luncheon meats, hot dogs, ham, and sausage contain an abundance of sodium. One serving of these products has the potential for harboring 310 to 680 milligrams of salt in addition to 23 grams of fat. Older adults are often sensitive to salt and experience marked increases in blood pressure after eating it. Processed meats are also typically manufactured using chemical preservatives, which might contain carcinogens. Removing unhealthy foods from the diet is one of the many ways seniors can maintain their health. Seniors who want to remain healthy as they age can benefit in a variety of ways when they receive professional at-home care. Huntington, WV, Home Care Assistance is here to help your loved one accomplish daily tasks, prevent illness, and focus on living a healthier and more fulfilling life. Dairy products provide much-needed vitamin B12, calcium, riboflavin, and protein. However, whole milk products also contain cholesterol and saturated fat, which contribute to cardiovascular disease. While consuming dairy on occasion is fine, encourage your loved one to choose low-fat cheeses, milk, and yogurt. Blue cheese, ranch, and thousand island dressings remain popular choices. 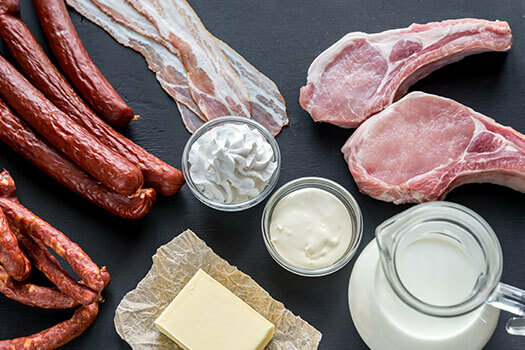 However, two tablespoons of these items also provide approximately 380 milligrams of sodium, 120 calories, and 12 grams of fat along with 2.5 grams of saturated fat. When eaten routinely, creamy dressings contribute to weight gain and cardiovascular conditions. Encourage your loved one to eat non-creamy or light dressings. Each tablespoon of stick butter or margarine contains up to 100 calories, 11 grams of fat, and 7 grams of saturated fat. It is easy to exceed the recommended serving, as solid forms make the products harder to spread on bread. Consider switching to canola or olive oil, which contain mono or polyunsaturated fat, or use whipped products. From preparing nutritious meals to making healthy lifestyle choices, seniors may need assistance with an array of tasks. Some seniors only require help with a few daily tasks so they can maintain their independence. However, those living with serious illnesses may need more extensive assistance. Luckily, there is professional live-in care Huntington, WV, seniors can rely on. Home can be a safer and more comfortable place for your loved one to live with the help of an expertly trained and dedicated live-in caregiver. French fries, hash browns, and tater tots are popular options for side dishes. However, one three-ounce serving harbors up to 540 milligrams of sodium, 190 calories, 11 grams of fat, and 3 grams of saturated fat. It is much healthier to bake or roast a potato. One cup of canned soup contains approximately 800 grams of sodium. Look for low-sodium options to serve your loved one, or make your own soups. Potato chips, cheese puffs, and similar snacks are typically loaded with calories, fat, and sodium. Although labels generally provide the nutritional statistics for a one-ounce serving, most people do not stop with eating one ounce. Consuming eight ounces of processed snacks easily increases a daily calorie count by 1,200. Carbonated soda, fruits juices, and other sweetened drinks contain some form of processed sugar, which stimulates inflammatory cytokine compounds in the body. Inflammation contributes to cardiovascular and musculoskeletal issues. Artificially sweetened beverages have been known to pose a risk to cognitive health. Your loved one should consider drinking more water or unsweetened teas. Some seniors need help preparing fresh juices, smoothies, and other healthy meals and drinks at home. If your aging loved one needs occasional help with bathing, grooming, cooking, or other basic household tasks, or if you need time to attend to important personal matters, reach out to Home Care Assistance, a leading provider of live-in and respite care. Huntington seniors can maintain their independence while living at home with the help of our reliable respite caregivers. If your loved one needs help with everyday activities, call us at (304) 521-2909 today.